Mama, we know that you’re counting down the days until Spring Break! It’s that magical week where you can sleep in (hopefully), relax in the sun (at some point), and giggle with your family (more than referee arguments). Digging in the sand and running in the waves and hunting for seashells is guaranteed to wipe out your little ones. That means you have the evenings free, after you put on a movie so your kids will instantly crash. But before you can load up the car for your week away in paradise, you’ve got to pack. That may feel daunting, because you’re not only packing for yourself but also your children (and probably a cooler and a beach bag and beach toys, etc.). 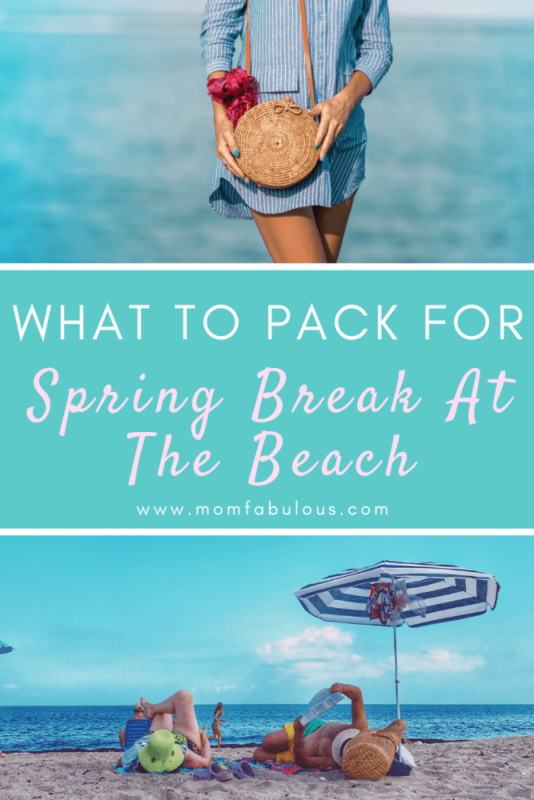 Mama, we have a Spring Break beach packing list to help you pack the ultimate yet simplified beach bag, plus a few personal items to stash in your suitcase. First, what should you pack in your beach bag? We recommend that every Mama packs the beach bag at home. That way you can arrive at the beach and settle into your hotel or apartment. And when your kids beg and beg to hit the sand, you can make their wish a reality. Note: I know, Mama, that a family beach bag comes with many items. Consider one bag for personal items, one for toys (so you don’t spread the sand), and one for food and drinks. Bring a wagon or distribute the bags among your family members. ID and cash: You want to keep your photo ID on you at all times, especially if you’re driving to the beach. And cash is perfect to buy something from a vendor or pay for parking fees. Sunscreen: for the face and body. Don’t forget to re-apply! Our recommendation. Towels: It never hurts to bring two for each person (one to sit on and one to dry off with). Hand sanitizer: Duh, kids can get messy. Who knows what they will get into, not to mention the porta potties! Our recommendation. Hat and Sunglasses, with an optional beach umbrella or tent: Keep your skin protected from the sunshine. If your children have sensitive skin, bring a large umbrella or a pop-up tent so they can stay in the shade. Medicine: Tylenol and Benadryl are excellent to keep in your beach bag. You never know! Reusable chargers: For those moments when your kids are dying of exhaustion and need to be occupied with technology (no shame, Mama!). Plus, you want to snap photos of the memories your family is creating! Toys (in a separate bag): Shovels, pails, trucks and boats. Keep these separate so they don’t get sand or water on your other items. Snacks and water (in a separate bag/cooler): Remember to drink more liquids than normal when the weather is hot or when you’re more active than normal. Bring along water bottles and juice boxes to ensure your kiddos stay hydrated. And of course snacks prevent hangry outbreaks for everyone in the family. Swimsuit and coverup: You’re going to be spending many hours near the water. Pack at least one suit and one coverup for your week. Note: If you’re going to the beach and in a pool, bring along two suits. That way you always have a dry swimsuit to put on. Cute sandals and flip flops: Flip flops were made for the beach. But cute sandals are perfect for a trip to the store or visiting a restaurant. Book or journal: To read while the kid are happily playing, napping, or in the evenings. Note: Please give your full attention to your children while they are swimming or near the water! Maxi skirt/dress: This will look nice but also keep you cool in the warm weather with a chilly evening breeze. Plus these pack well! Something pretty for after the kids go to sleep: (Insert a winking emoji here) Are you and your hubby having a date night without the kids? Can you plan a surprise evening once the little ones crash in front of a movie? Bring something lacy to create fantastic Spring Break memories with your man. Candles, alcohol, or bubble bath are optional too! Razor: Because everyone will see all of your legs when you’re in a swimsuit. Sea Salt Spray: To keep your hair in place from the ocean breeze or to refresh it for a nice evening out. Make you own batch in 3 minutes using our favorite recipe! This wasn’t meant to be a comprehensive list of everything you need for the beach. 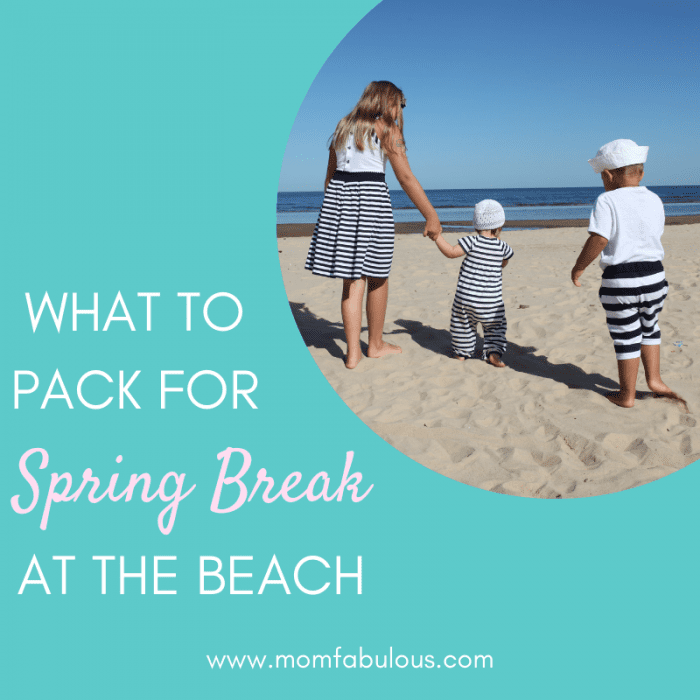 But it should help you, Mama, prepare for an amazing Spring Break at the beach!